This is my 3rd recipe for rice cooked in a rice cooker. Prior to this, I have a recipe for Chicken Rice as well as Long Bean Rice. This is another one of the vegetable rice recipes which can serve as a meal on its own. 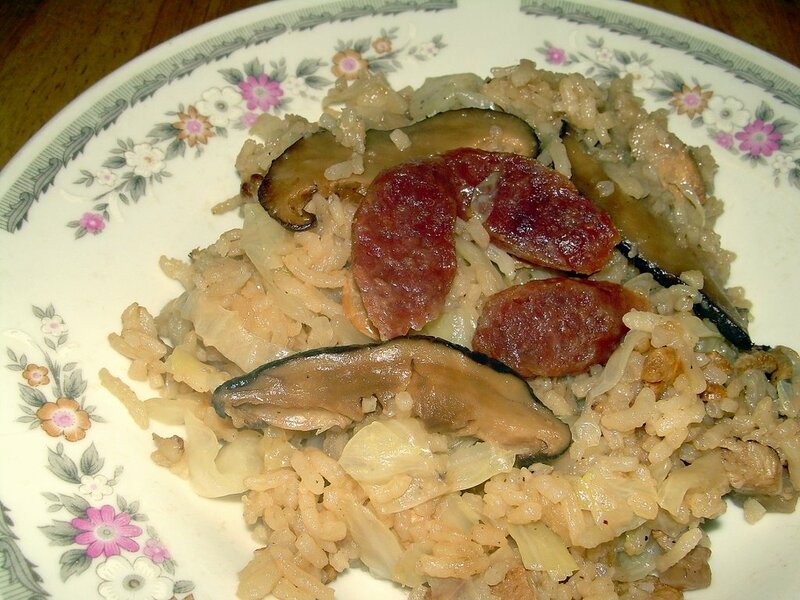 Cabbage Rice with Lap Cheong (Chinese Sausages) is quite mild in flavour but sweet in taste. The sweetness comes from the cabbage. The type of cabbage we usually use is the chinese cabbage, which is white in colour and longish in shape rather than round. Try not to leave the rice uneaten overnight as I believe that the cooked cabbage does not withstand being kept overnight that well. If you don’t have lap cheong, you can even substitute it with ham or even salami! Do experiment. As I have emphasised many times before in my recipes, you can actually experiment with the ingredients once you get the basic idea of how the dishes are cooked. The presentation of the rice in the picture above could be much better but the taste definitely is! Bring water to boil. Add belly pork and let it boil till cooked. Remove pork. Cut into small pieces. With remaining oil in wok, fry the cooked belly pork till beginning to brown. Remove pork. With remaining oil, fry the dried prawns and chinese mushrooms for 1 minute till fragrant. Add cabbage and put back the pork into the wok and continue to stir fry for 1 more minute. Add seasoning and a little bit of water (used to soak mushrooms / dried prawns) to keep it moist. Add pre-soaked rice into the ingredients and stir well for 1 minute. Transfer the ingredients into rice cooker and add water till it covers rice completely just like how you usually cook rice. Turn on the rice cooker. Check occasionally for water to dry out from the upper layer of the rice. Once that happens, place lap cheong on top of the rice, cover lid and wait for rice to cook completely. Sprinkle fried shallots over rice before serving. I done cabbage rice before too. I love it very much coz the cabbage adds sweetness. But I use char siew. P.S Cannot submit comments to ur tang hoon post leh. i prefer this way….no need to heat up a wok with lotsa of smoke and less oily..
tigerfish : I like to add more dried prawns cos I like the smell. LOL! I tried a lot of ur recipes . Thx 4 so many ideas ! Do you hv the recipe for PUMPKIN RICE WITH PORK ( all in a pot ) . Think is a hokkien dish . Just cook with rice cooker . I can’t find it online . conn : Thanks for having faith in my recipes! 🙂 I suggest that for the pumpkin rice recipe, you substitute the cabbage with pumpkin. Cut the pumpkin into cubes. with all due respect, that’s an awful picture. The recipe sounds good, but the picture is about the most unappetizing thing I’ve ever seen. You should really try to get a better one.